I love October. Halloween is my one of my favorite times of year, and it’s even better with kids! 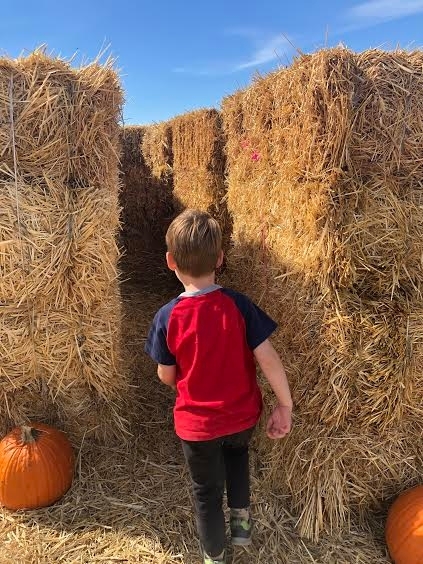 The San Francisco Bay area has tons pumpkin patches (Half Moon Bay is particularly well-known for it’s annual Pumpkin Festival and pumpkin patches) but we wanted to try something new. 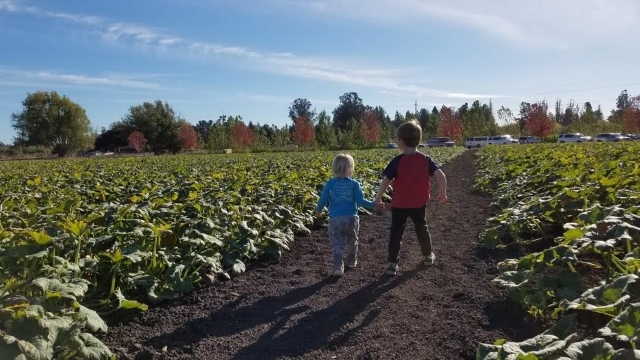 We spent an hour driving up to Petaluma to check out two unique pumpkin patches. Peter Pumpkin Patch is part of a working farm and dairy and is wonderfully rustic. The pumpkin patch itself is a little wild, and has many enormous pumpkins and squash still on the vine. Our four-year-old was very pleased with his find of a warty gourd. They also have an area to dig your own potatoes with provided pitchforks. We had fun trying, but didn’t find any potatoes this time. 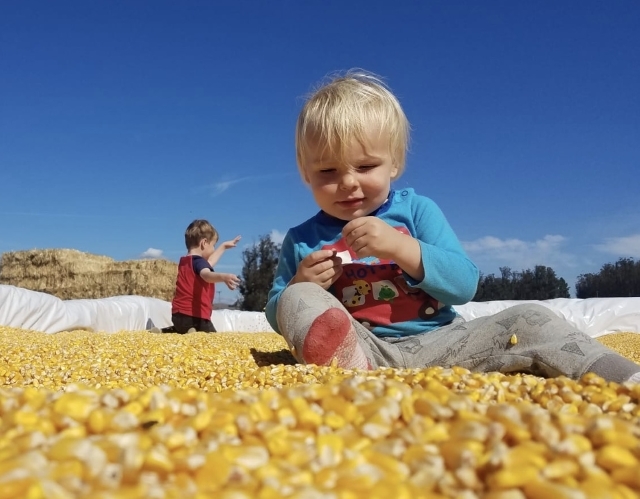 They have a huge corn kernel pit that both our 4-year-old and almost 2-year-old loved. It was an interesting experience for me. It’s like being on the inside of a bean bag. Both of the patches we visited had corn kernel pits but we preferred the one here because it was deeper and bordered by soft, plastic-covered bales of hay. The corn maze here is petite, and our son ran through it excitedly at least a half dozen times. They also have sheep, goats, a cow you can milk (with a farmer present! ), and a ton of adorable calves. The kids loved playing around the ghost town facades that were set up. They also sell cheese, butter and some other products. Although the pumpkins weren’t close to supermarket pumpkin prices, they were a fair bit cheaper than similar pumpkins in Half Moon Bay. Petaluma Pumpkin Patch gives a cleaner, more manicured farm experience, and is right next to the 101 highway. It is also much larger. 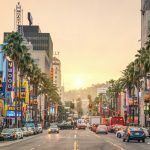 We found it perfectly uncrowded on Friday afternoon. Their pumpkin patch is large and well kept, with many beautiful pumpkins. Most are still on the vine with amazing stems. 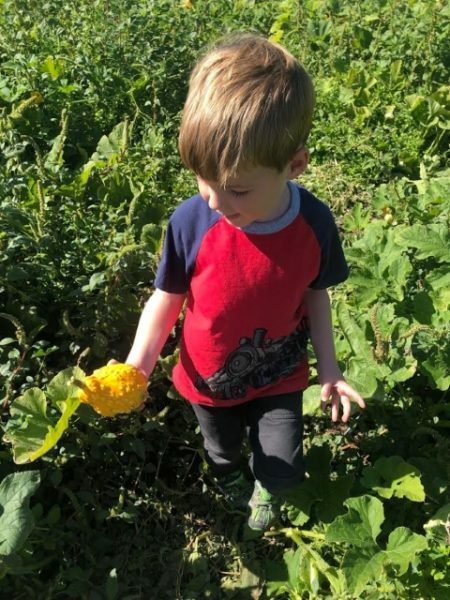 Our four year old definitely preferred this patch because there weren’t as many bugs, while our toddler really seemed to love the wildness of the Peter Pumpkin Patch. The big draw of this patch is their world-class corn maze, which is 4 acres in size and takes around 45 minutes to complete. Our young kids had no interest in it, so we didn’t take the challenge. Admission to the corn maze is $7, but kids 5 and under are free. 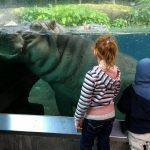 Other paid activities include inflatables (a small bounce house and a bouncy obstacle course, $6 per person for all-day access) and a super slide ($2 per ride, must be 42″ tall to ride alone). We thought these were well worth the money. Bounce house = happy, tired kids! 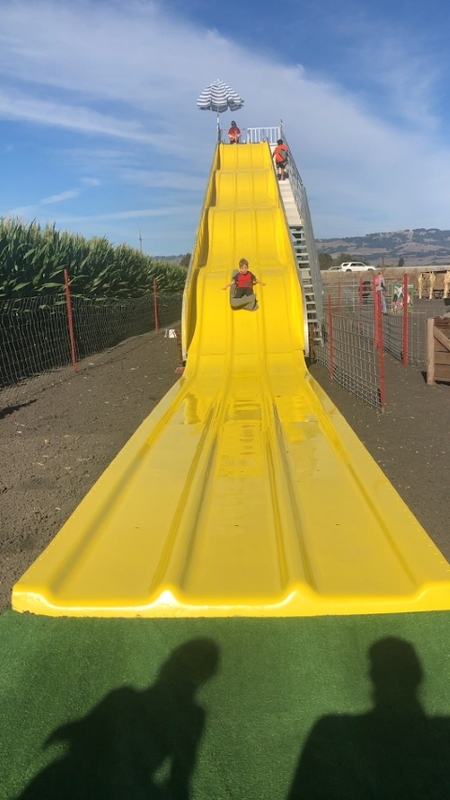 Petaluma Pumpkin Patch’s free activities include a corn kernel pit, which is smaller than the one at Peter Pumpkin Patch and only for the 5 and under crowd. Their pit is shaded, however, which is nice for young kids. They also have farm animals on display: pigs, goats, sheep, a large calf, and two horses. A couple of food options and a picnic area round out the experience here. Peter Pumpkin Patch felt like a more authentic farm experience, while Petaluma Pumpkin Patch has more activities. 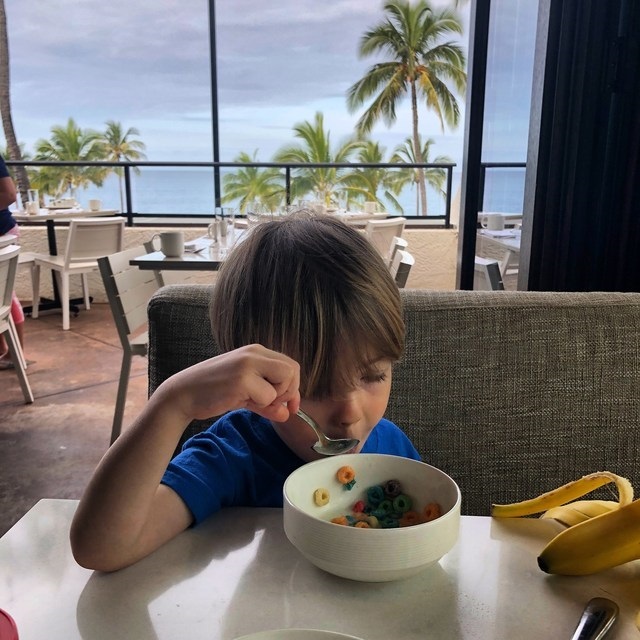 We recommend both locations and our kids loved both! 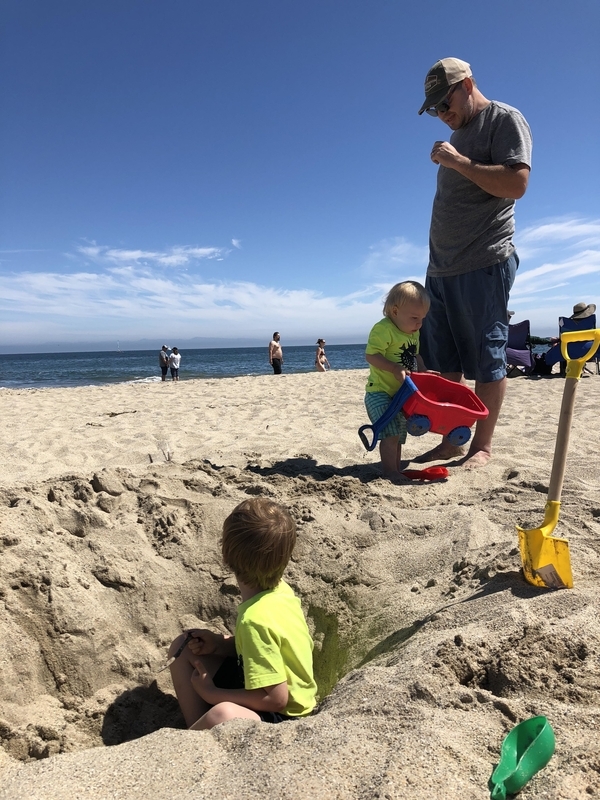 They combined to make a nice full afternoon after an hour-long drive from San Francisco.